Basil is an annual plant; its thin, branching root produces bushy stems growing from 1-2 feet high and bearing opposite, ovate, entire or toothed leaves which are often purplish-hued. The two-lipped flowers, varying in color from white to red, sometimes with a tinge of purple, grow in racemes from June to September. The plant is very aromatic. Tends to favor sunny banks. Other varieties: Dwarf Spicy Globe, Dwarf Bush Basil, Lettuce-leaf basil (O. basilicum crispum), Dark Opal, Purple Ruffles, Citriodorum, Fino Verde, O. basilicum miminum, O. sanctum, O. kill-mandscharicum, O. gratissimum, etc. Found wild in the tropical and sub-tropical regions of the world; elsewhere it is cultivated as a kitchen herb. Essential oil, estragol with linalon, lineol, tannin, and camphor. 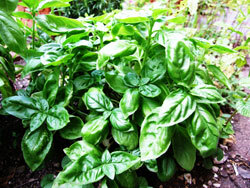 From its native India, basil was introduced into Europe in ancient times. Views and traditions associated with the herb have been mixed. Some cultures associated basil with hatred and misfortune; others regarded it as a love token. Dioscorides said that it should never be taken internally, while Pliny recommended smelling it in vinegar for fainting fits. In Ayurvedic medicine, basil is known as tulsi and the juice is widely used. In India, basil is perhaps the most sacred plant, next to the lotus. The scent of basil, they say, is conducive to meditation, and the plant is often used in magic. Also a popular culinary herb. In China this herb is known as Luole. Haitian merchants often sprinkle their stores with a composition made of this fragrant herb soaked in water. According to creed this chases bad luck and attracts buyers. The herb is much used as a love charm in voo-doo practice. Basil’s usefulness is generally associated with the stomach and its related organs. It can be used for stomach cramps, gastric catarrh, vomiting, intestinal catarrh, constipation, depression, menopause, and enteritis. As an antispasmodic, it has sometimes been used for whooping cough. Basil has also been recommended for headache. It increases the appetite, tends to increase the flow of milk, improves blood circulation, enhances the digestion, good for coughs, relieves gas pains, and is an aid for indigestion. Treats fevers (tea made with basil and peppercorns reduces fever), colds, flu, coughs, sinusitis, stomach cramps. The leaves are good for rubbing on insect bites. Externally, it is used to soothe bloodshot eyes and relieve itching from hives. In ancient Egypt basil served as a medicine for snakebites, scorpion stings and eye troubles. The fresh leaf juice is used externally to treat fungal infections on the skin. The crushed leaves were applied to painful parts in cases of rheumatism. Pliny recommended basil tea as a remedy for nerves, headaches and fainting spells. In Italy, particularly in the south, it is found in practically every garden and widely used for seasoning. Basil will quell the most violent vomiting and nausea. Particularly good at arresting morning sickness and travel sickness. Infusion: steep 1 tsp. dried herb in 1/2 cup water. Take 1 to 1 1/2 cups a day, a mouthful at a time. Can be sweetened with honey if taken for a cough. Do not use the essential oil externally or internally during pregnancy. 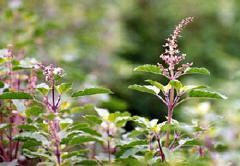 LiveStrong.com: What Are the Benefits of the Tulsi Plant? PubMed.gov: Antifungal activities of Ocimum sanctum essential oil and its lead molecules.